Rabbi Wolpo and Shabtai Weintraub indicted after giving money prize to soldiers refusing expulsion orders against Jews. 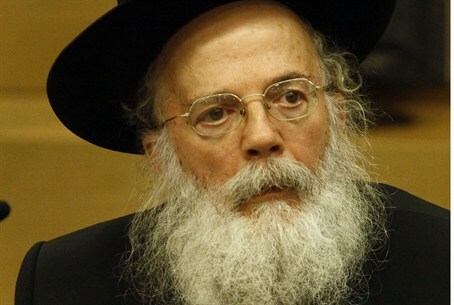 The Jerusalem District Attorney submitted an indictment against Rabbi Shalom Dov Wolpo and Shabtai Weintraub to the local Magistrates Court on Tuesday. The two were accused of inciting insubordination against IDF orders to expel Jews. Attorney General Yehuda Weinstein certified the indictment, which centers on an incident from October 2009. At an IDF training graduation ceremony of the Shimshon Brigade, which took place at the Kotel (Western Wall), two soldiers were given 20 days in military prison after waving a sign reading "Shimson Brigade doesn't expel Homesh," referring to a Samaria community destroyed in the 2005 "Disengagement." 19 days after the incident, at a nationalist conference in Jerusalem attended by hundreds of people, Rabbi Wolpo and Weintraub spoke, calling the two soldiers "heroes of Israel" and giving envelopes with money to their families for the days of incarceration. Behind the two was a sign reading "Citation Ceremony for Prisoners of Zion." Weintraub announced at the event "every Hebrew mother should know that if her son waves the sign 'Shimshon Brigade doesn't expel Homesh,' he'll get 1,100 shekels ($315) for every day (of incarceration)." Meanwhile, Rabbi Wolpo compared the self-sacrifice of the soldiers to the binding of Isaac from the Torah. He further addressed the IDF, saying "every soldier that gets jail for refusing an order, for this most illegal order to expel Jews from the land of Israel, he will get a prize...if a commander wants to give a prize to his soldiers, let him put them in jail." During the public handing out of the cash prizes to the soldiers' families, Weintraub responded to a question about the amount being given, noting "there's according to the days. They sat (in jail) 18 days, 1,100 per night. 19,800 shekels ($5,695)." In addition to the incident, which was publicized in the media, Rabbi Wolpo was charged in an additional incitement to disobedience case from the summer of 2011. After refusing an order to accompany his unit on a mission connected to the expulsion of Jews from the Samaria community of Ramat Migron, soldier Idan Hershlikovitz was given 20 days in military prison. Speaking afterwards at a conference on the establishment of the "Jewish Authority in Judea and Samaria," Rabbi Wolpo emphasized the rights of the Jews on their land, and warned of attempts to give up land in "peace deals." "But there's a bright spot," remarked Rabbi Wolpo in his concluding remarks. "The soldier Idan Hershlikovitz was ready to sit 20 days in jail so as not to commit a crime like this. A crime of destroying homes...expelling Jews from the land of Israel. Therefore, certainly for a crime like this the soldiers are commanded to refuse orders...to expel Jews." Rabbi Wolpo sarcastically encouraged soldiers to tell their commanders to give them more jail time, for they would receive money for every day in jail. He then invited the soldier's parents to the stage, handing them an envelope with a thousand shekels for every day of their son's jail time, and praising their parenting. Responding to the indictment leveled against him, Rabbi Wolpo remarked "we didn't even get the indictment, it was spread to the media before it reached us. This is a ridiculous political indictment which (State Attorney) Shai Nitzan decided on, it's an attack on the freedom of expression in Israel and is meant to silence the right for the next expulsion." The rabbi remarked that left-wing organizations such as B'tselem, whose activists have been documented assisting attacks against the IDF, have never been put on trial. He accused Nitzan, who took his position last November, of "using the State Attorney's office for a leftist agenda." "All of the complaints that were submitted against leftist organizations didn't even make it to a police investigation and were stopped by Shai Nitzan; the process here is to frighten those loyal to the land of Israel through a political indictment," charged the rabbi.